I'm sorry we did not receive your image. 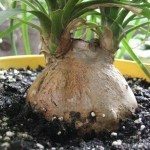 It may grow another pup or stem, but if the stem died from a fungus or disease this could be an issue. I would cut the stem down with a clean sharp knife or scissors. The open stem end can increase the chances of disease or insects effecting the plant. You can use Neem Oil on the plant as it does work as insecticide and a fungicide.